This week I found a "new" book to use at the beginning of the school year. I say "new" because it is a few years old, but I just came across it. The book is Goldie Socks and the Three Libearians. 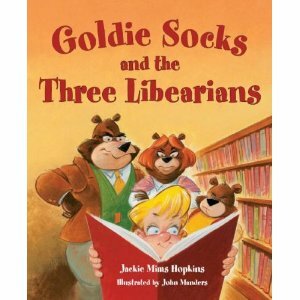 This is a wonderful spin-off of the Goldilocks story, only this time the three bears are all librarians. Goldie explores the house while the bears are not home and uses the "5 finger rule" to fine a "just right" book before she is discovered by the bears. Enjoyed by my fourth graders! Ooh, I like it! I need to purchase this one. We just discussed just right books in our room. :) Thanks for the suggestion! This sounds so cute but also great for teaching the kiddos how to find a book that is just right!